The objective is to promote scientific research, studies, fine art, literature, cultural activities and the preservation of our cultural heritage. The foundation may also provide financing for medical equipment and engage in punctual support in human or environmental incidents. The C. Ehrnrooth Foundation provides grants and other financial support to individuals, institutes, organisations and universities engaged in promoting scientific research, studies, fine art, literature and cultural activities. 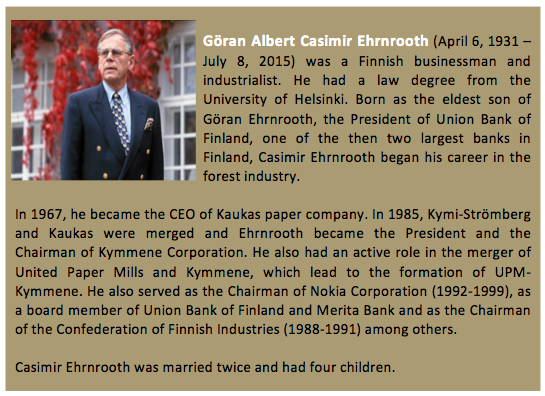 The foundation also established the Ehrnrooth Fellowship at the Clinic of Neurological Surgery of the Helsinki University Central Hospital, for post-graduate studies training and research in neurological surgery and diagnostics.